As I reached 100 levels today, let's celebrate with some screenshots! Also you might notice that I also decided to rename the pack from Lemmings Reunion 2 to Lemmings United. Here we've got some beginner friendly puzzles, X of everything levels and even 2-3 levels that try to introduce you to all the skills. Basic tricks will be teached and at the end of the rank, you might even get some first challenges. Harder puzzles more advanced tricks and more and more skill combinations...what's more to say? Things might get hairy now, so grap your thinking cap and puzzle your way through! 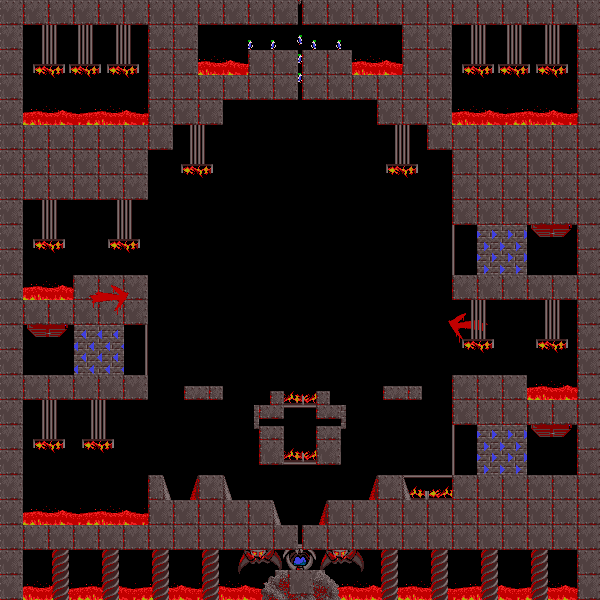 Puzzles tend to get really complicated and confusing now and you 100% need to know exactly how skills and lemmings behave under all circumstances. Good luck dear NeoLemmix player as you now reach the pure organised chaos I prepared for the final rank. Expect mind-blowingly hard puzzles (with at least a few breathers ) that will try to get you into a mental hospital. Here I've got some extra content for you! It's basically all contest, collaboration and extra stuff that I've done over the time roughly ordered by difficulty. So I hope that I've got you a little bit hyped for the pack and stay tuned for further updates! Alright, I finally hit the 30 level mark today! Also I started another project to further improve this levelpack. It's a tileset which is based on 4 tiles. These 4 tiles will be the main "blueprint" for the others. I gave it the alias name "A I" in IRC, but encountered now that the actual name is too long for the editor to handle (Arrakis industrial). So now it's simply called "Dune". As you can tell from the name it has the theme of the Dune PC strategy games. + This project should also serve to increase my drawing + animation abilities which are still quite lacking! Also I already recolored the L3 biolab hatch for this tileset so that I can test how it actually looks in game. Even these tiles are not 100% ready as I see a few pixel which could need a bit further recoloring. Next up would be pipes based on the Harkonnen ram horns + steel based on the little steel-like near area of the Harkonnen symbol. Also some normal terrain will be based on this color sheme. Out of the Atreides symbol I will draw blue terrain blocks to add more variety. Also sth like an industrial smasher is planned which maybe releases some steam when activated. The exit/s will also be based on the symbols adding sth like the horns or blue wings to it. But enough for the terrain plans for now. I plan to average 1 tile/object every 2 days or so. I will keep you informed about this when significant progress has been made! Currently sitting at (only) 37 levels + I drew a few more pices for the Dune tileset. , + I even think that some Reunion levels are quite "low-quality" in comparison. is just barely enough ----> requires some sort of planning. Also I consider my "current" music selection to be much more fitting and overall better. I am thinking about making the Harkonnen emblem (the red one) steel as well, because it "could" be mistaken for steel. What do you think here? Everything is still Alpha, so I might recolor some things in the future. Nextup will probably be the exit (which will be very hard to make with the picture I have in my mind right now), followed up by some terrain pieces in the Atreides blue. Added a locked exit as well as I was on it. Still traps, teleporter, and the pickup/updraft stuff to make. Put a tacker in the Topic headline to inform about the level creation progress. 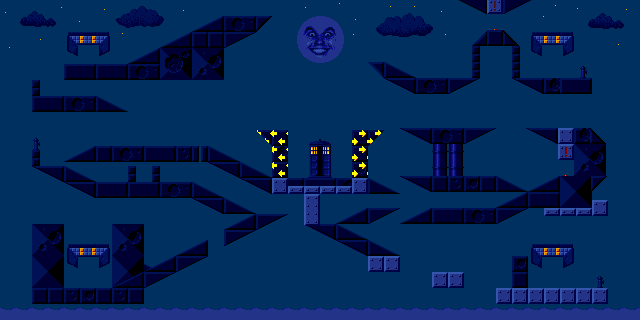 A lot of tiles + water and fire has been added. - Can handle a Lemming flow up to RR 56. It kind of looks like the blood on the top part gets sucked up into it. Instead perhaps, make it look more like it's dripping down and joining the pile at the bottom (that presumably sinks into the ground). Yes that should look way better. I want to make some little changes to the smoke as well anyway, as a few pixels seem a bit of and the animation is not quite optimal yet. This trap probably needs a few rounds of finetuning to get it more fluent. In regards to the smoke, perhaps try gradually darkening the pixels rather than simply reducing the density of them? Lovely trap! You can draw after all. Many things to try, see what works best. The animation details don't affect physics, therefore they don't have to make sense individually, but make sense as a whole in the entire animation. Thanks Working on this greatly improved my pixel-drawing skills so far and getting these 100% custom trap animations right will provide further training. Alright, reworked the trap animation and also made more colored tiles + more different steel shapes to ensure you always get the steel you need! I will possibly release a beta of the tileset after that, to get additional feedback from you, but when the time comes do not create real levels with it yet as it is nearly sure that stuff will be changed! The trap animation is very well done! I still have to create/design animated Objects (traps, doors, ...) for my Android game, and I hope I'll be able to deliver assets with a similar quality. Furthermore I forgot 16x8 sandstone ramps, so I added those as well. Finally OWW's etc are also included now. I will reorder the tiles in a more logical order in the next step and after that I think I will release it for a little beta test round! Hit the 50 level mark today! Caught up some speed again after finishing up the Dune tileset. Got a good feeling that I will be able to finish this pack this year.